I Do Whatever a Tractor can do ! Grading for Playsets, Sod, etc. We specialize in a wide range of concrete repair services for residential and commercial buildings. Our services range from fixing cracks on your driveway at home to repairing warehouse floors with our 2 part polymer system. 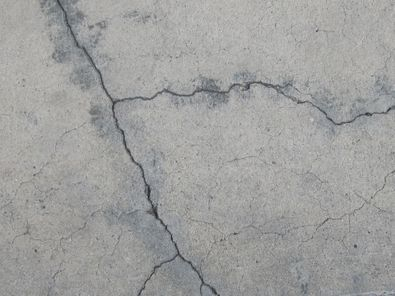 Different concrete surfaces will require different methods of repair. Concrete repair of the floor in a home's basement will differ significantly from that of a large warehouse or supermarket. Our expertise in concrete repair with different kinds of structures and concrete surfaces puts us in a unique position to satisfy our customers needs. We resurface your concrete driveway or sidewalk. There are a few options as far as how long the treatment will last. This process is usually a temporary fix, but a much more affordable one. This involves first cleaning the concrete. Then the repairs are made to the cracks using a Polyurethane Sealant. The resurfacing material is then spread using a push broom or squeegee. This is an image of my driveway after a coating of special adhesive, and Portland cement were applied. There were four cracks that went from side to side from top to bottom of the drive. This repair would have been under $500.00 and took most of the day.